Shall the voters of the City and County of Denver adopt a measure that secures and enforces basic rights for all people within the jurisdiction of the City and County of Denver, including the right to rest and shelter oneself from the elements in a non-obstructive manner in outdoor public spaces; to eat, share accept or give free food in any public space where food is not prohibited; to occupy one’s own legally parked motor vehicle, or occupy a legally parked motor vehicle belonging to another, with the owner’s permission; and to have a right and expectation of privacy and safety of or in one’s person and property? Sec. 28-254. Protected Rights of People. (a) Purpose. The purpose of this section is to secure and enforce basic rights for all people within the jurisdiction of the City and County of Denver, including the right to rest and shelter oneself from the elements in a non-obstructive manner in public spaces, to eat, share, accept or give food in any public space where food is not prohibited, to occupy one’s own legally parked motor vehicle or occupy a legally parked motor vehicle belonging to another, with the owner’s permission, and to have a right and expectation of privacy and safety of or in one’s person and property. (1) “Public space” means any outdoor property that is owned or leased, in whole or in part, by the City and County of Denver and is accessible to the public, or any city property upon which there is an easement for public use. (2) “Rest” means the state of not moving, and holding certain postures including but not limited to sitting, standing, leaning, kneeling, squatting, sleeping or lying down. (3) “Non-Obstructive Manner” means a manner that does not render passageways impassable or hazardous. (4). “Motor Vehicle” includes vehicles defined in Colorado Revised Statutes Sections 42-1-102 (58), Camper coach 42-1-102 (13), trailer coach 42-1-102 (106) (a), or noncommercial or recreational vehicle 42-1-102 (61). (5) “Ceiling preemption” means any limitation on local law-making that limits the amount of protection local law may extend to municipal residents that exceeds state or federal protections. (6) “Municipal Subordination” means any exercise of “Dillon’s Rule,” preemption, or other mechanism used to usurp the right of the people of Denver to use their City and County government for the protection of residents’ rights. (1) The right to rest in a non-obstructive manner in public spaces. (2) The right to shelter oneself from the elements in a non-obstructive manner in outdoor public spaces. (3) The right to eat, share, accept, or give free food in any public space where food is not prohibited. (4) The right to occupy one’s own legally parked motor vehicle or occupy a legally parked motor vehicle belonging to another, with the owner’s permission. (5) The right and expectation of safety and privacy of or in one’s person and belongings while occupying public spaces. (1) It shall be unlawful for the City and County of Denver to enforce any ordinance, resolution, regulation, rule or policy that limits, prohibits or penalizes the rights secured by this ordinance. (2) It shall be unlawful for any public law enforcement officer, private security employee or agent, corporation, business or other entities to violate the rights recognized and secured by this law. (3) It shall be unlawful for an employee or agent of any government agency, corporation, business, or other entity to harass, terrorize, threaten, or intimidate any natural person exercising the rights secured by this ordinance. (1) Any law enforcement officer or other agent of the City and County of Denver who detains, causes to move, or violates the protected rights in Section (c) of this ordinance has committed a civil rights violation(s) under color of law. This prohibition includes, but is not limited to, requesting identification by any person unless supported by reasonable suspicion of a crime. (2) The City and County of Denver, or any resident of the City and County of Denver, may enforce the rights and prohibitions of this law through an action brought in any court possessing jurisdiction over activities occurring within the City and County. In such an action, the City and County of Denver or the resident shall be entitled to recover as a prevailing party all costs of litigation, including, without limitation, expert and attorney’s fees. (3) All laws adopted by the legislature of Colorado shall be the law of the City and County of Denver only to the extent that they do not violate the rights or prohibitions of this law. Where state or federal law is more protective of human rights and civil rights than this local law, the state or federal law controls. (1) The provisions of this law are severable. If any court decides that any section, clause, sentence, part, or provision of this law is illegal, invalid, or unconstitutional, such decision shall not affect, impair, or invalidate any of the remaining sections, clauses, sentences parts, or provisions, of the law. This law would have been enacted without the invalid sections. (1) All inconsistent provisions of prior laws adopted by the City and County of Denver are hereby repealed, but only to the extent necessary to remedy the inconsistency. (1) All provisions of this act shall take effect immediately. ← Homeless Class Action Moves Toward Trial!! City’s Motions Denied. I can’t wait to see people get the help they need. So vote no on this absurd law. This will just make it easier for the homeless to stay on the streets rather than getting the help they actually need. My question is where are they supposed to stay if I vote no? It’s a great idea. I think it will get more individuals on its side if responsibilities of those sheltering, etc. are listed. For instance, no trash all over. I see homelesss individuals living in and around the park near my house. I hope they stay if they need to because they behave as good neighbors, just like I’m expected to do. Can you list your address? When I find another needle in the park where my children used to play, I want to bring it to your house. This is a good example of well intentioned people being just clueless to human nature. The one thing everyone wants is less homeless. The vast majority of homeless have addiction and mental health issues. Enabling addiction, etc. and therefore homelessness, which is what this does is not the answer. What should happen is tough love, drug use and possession along with criminal activity enforced. Forced drug monitoring once someone is in the system and at least attempts to hold employment. It’s 2% unemployment, if someone can fog a mirror they can get a job, so long as sober and functioning, so I don’t think this is unreasonable. 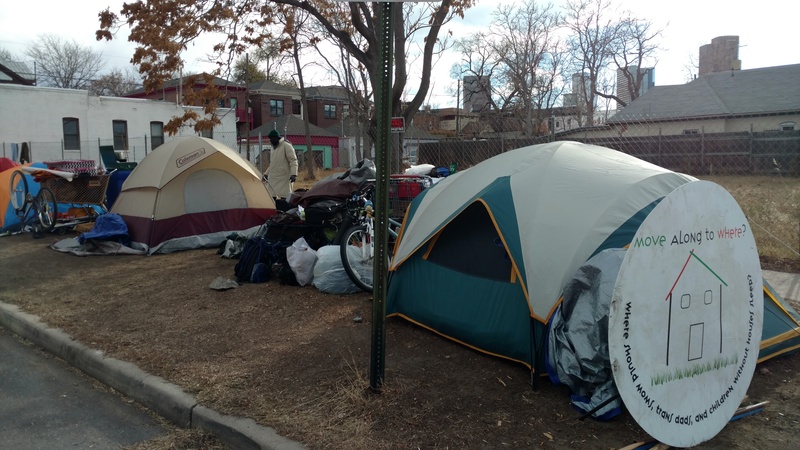 All this does is bring more homeless to Denver, discourage homeless from getting help, make public parks effectively off limits for all but the homeless and create serious public health issues. This is not the answer! Help for the mentally ill and drug rehab is the answer. Our parks and open spaces will be tent cities with no sanitation, or law. More homeless will come here because of easy access to drugs and our climate. Goodbye to our wonderful parks! You can help them as they will be able to camp in your yard. Pee, poop,puke and maybe even you know what. Enjoy. You can then clean up. You can help them as they will be able to camp in your yard. Pee, poop, puke and maybe even you know what. Enjoy. You can then clean up.